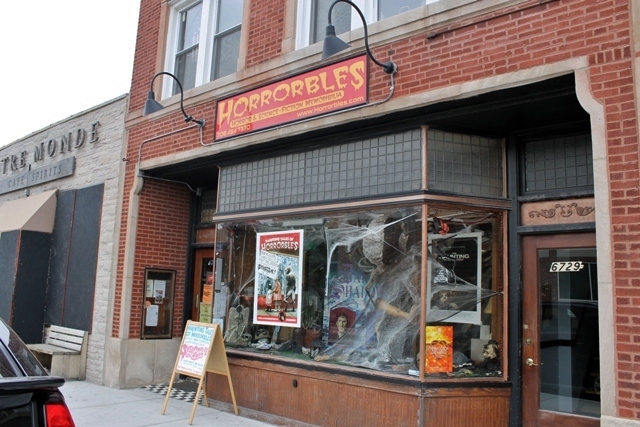 Horrorbles: The Best Little Horror House in Berwyn! Berwyn, Illinois is to a Svengoolie fan what Parma, Ohio is to a fan of one of their horror hosts, The Ghoul, and this is no coincidence. The Ghouls and Svengoolies have a shared lineage via a 1960’s horror host named Ghoulardi (you can learn more about that HERE). Berwyn may not have any more sculptures to entice its visitors but they do have something even rarer. On Roosevelt Road, right next door to old style bar appropriately named “The Friendly Tap,” is “Horrorbles.” Horrorbles is to an adult horror fan what Toys R Us is to the average kid. 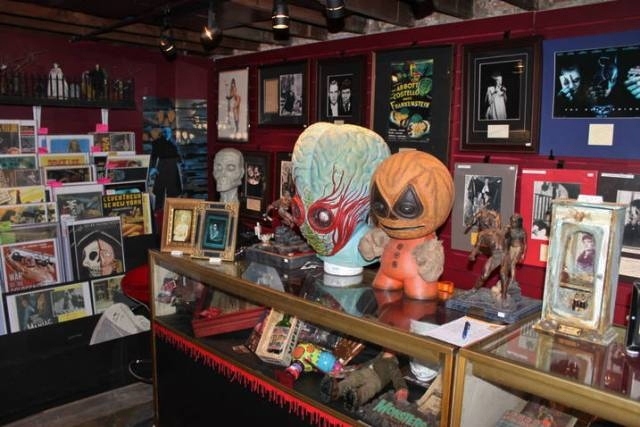 It is a store that sells horror movies, masks, collectibles, models, and..well..just about ANYTHING a horror fan could dream of. 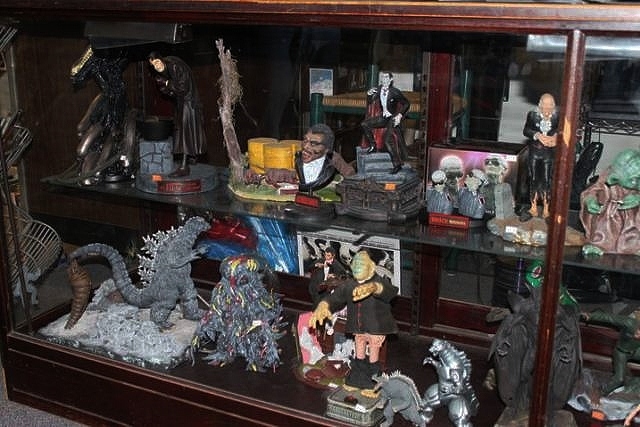 The store not only features the amazing collectibles you see here, but also features its “dungeon” of sorts. A set of stairs takes you down to a lower level that features even MORE great stuff as well as its own movie screening room. Select horror films are shown each week and offer a chance for fans to meet other like-minded souls. 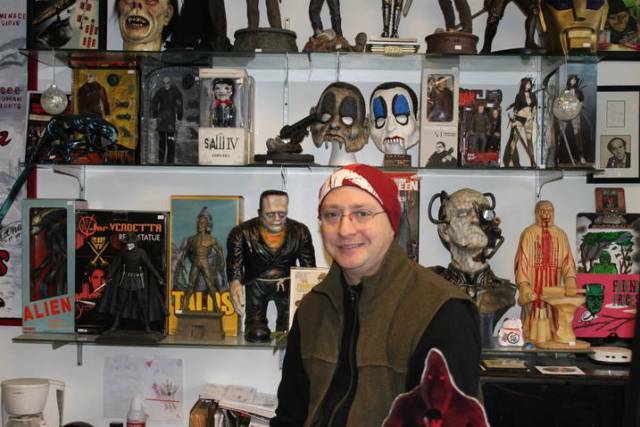 When my best pal and fellow Terror Dave, David Albaugh, first came to Chicago in March of 2010, we went straight from the airport to “Horrorbles” (read his telling of the story by clicking HERE). Just as Berwyn is linked to Svengoolie, “Horrorbles” solidifies the bond even further. 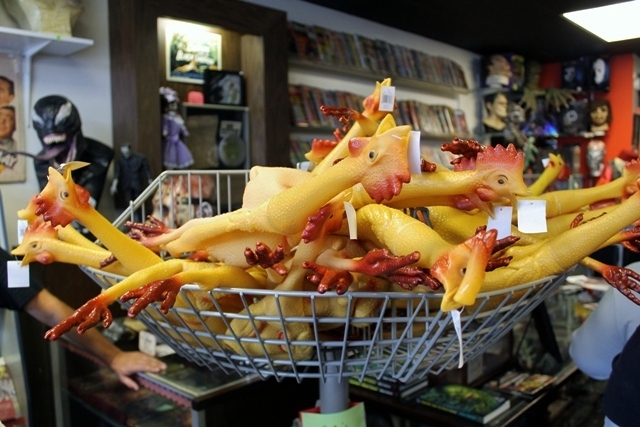 Fans who stay and watch Sven’s end credits will note that Horrorbles is the official supplier of the Svengoolie rubber chicken! 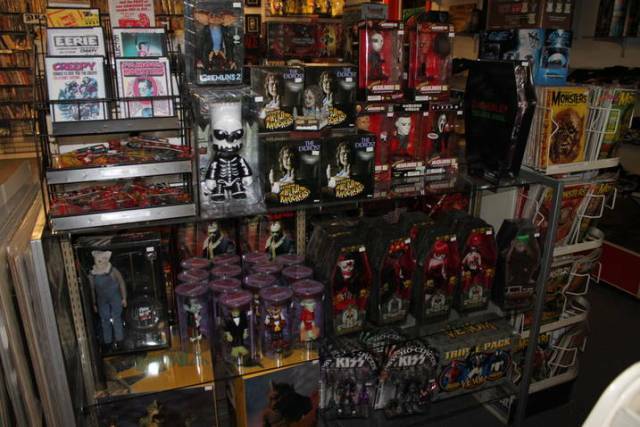 And speaking of Svengoolie, he recently returned to his favorite store to partake in unique event. That story coming SOON! This entry was posted in Haunted Attractions and tagged Berwyn Illinois, HORRORBLES, John Aranza. Bookmark the permalink. ← G-FEST and the Godzilla-sized Heart of Fandom!